a) What color are the pods on a cacao tree? and what color are the seeds inside the pod? b) Where are the trees cultivated (grown)? c) What are the three main varieties of cacao beans? d) Which explorer took the cacao beans back to the Spanish court where they were finally recognized as a “treasure”? e) What did the Aztecs season their chocolate drink with? f) When did the “modern era” of chocolate making begin? g) In 1849, English chocolate maker Joseph Storrs Fry made the first what? h) Who invented milk chocolate? i) List the 7 steps for making chocolate. Starting with the cacao bean. a) Who made the first drink made from the beans of the cacao tree? b) When was chocolate introduced to the United States? c) How many pound of chocolate will one cacao tree produce in a year? 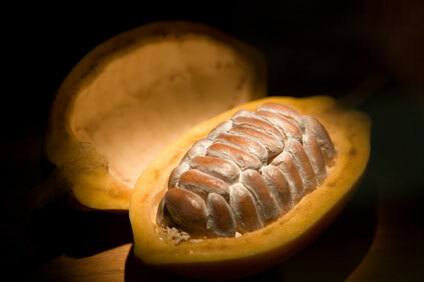 a) How many seeds are in a cacao pod? b) How many tons of cacao beans are harvested every year? a) What was the name of the drink that the Mayans and Aztecs drank? b) In 1847 the first “eating chocolate” was introduced, but it didn’t sell well. Why not? c) How many years does it take a cacao tree to mature? d) At what temperature are cacao beans roasted? e) Name three kinds of chocolate. 5. Last: Run a chocolate store! Here!